Over the weekend, the Chilean government ended a state of emergency enacted last month in response to the worst wildfire season in the nation’s history. The fires, which now appear to be dying down, have torched more than 900,000 acres—roughly four times the area of New York City—since January 15th. Forest fires are a normal part of Chile’s hot, dry, summer, but this year, the blazes have been exceptionally fierce and destructive. Since January, more than 100 wildfires have burned forests, destroyed plantations and vineyards, razed entire towns, and claimed at least 11 lives in in central and southern Chile, according to government and news reports. 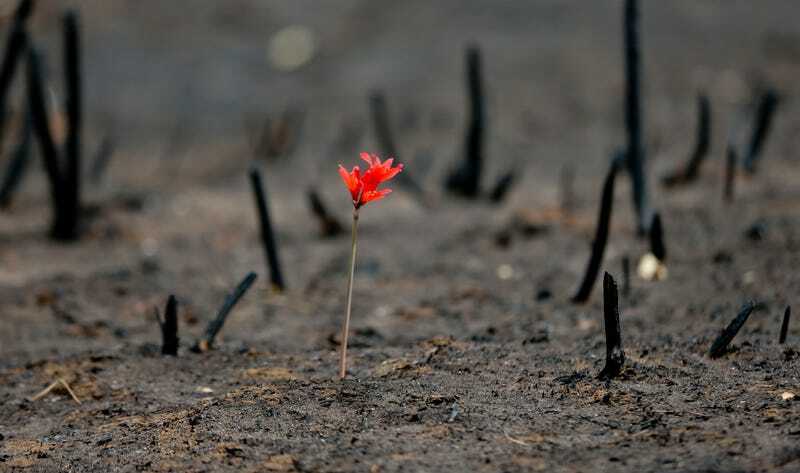 “Chile is living the greatest forest disaster in our history,” President Michelle Bachelet said, adding that the country has “practically exhausted its capacity to fight the blazes,” the BBC reported on January 22nd. A combination of a long-term drought and historically high temperatures set the stage for a very bad fire season this summer. But experts cite a multitude of other factors, too, including land use changes, inadequate firefighting resources, poor planning, and bad actors. More than forty people have reportedly been arrested and accused of arson in association with the fires. Alex Fajardo, a forest ecologist at the Centro de Investigación en Ecosistemas de la Patagonia (CIEP), Coyhaique, Chile, told Gizmodo that the spread of large, monoculture plantations of highly-combustible eucalyptus and pine trees are enabling wildfires to become larger and more intense than they were historically. Fire brigades seem to agree. “It’s much easier to control a fire in a native forest—they’re more humid and so a fire spreads more slowly,” Gustavo de la Fuente Ortiz, the fire brigade chief in Chillan, told The Guardian. Other firefighters have expressed frustration in their inability to tame fast-spreading blazes in forest plantations, which are often located close to communities. Water-bombing aircraft from the United States and elsewhere were brought in to assist in the firefighting effort last month. Thankfully, after multiplying for weeks, the fires appear to be simmering down with the arrival of cooler temperatures and much-needed rainfall in affected regions. On Saturday, Bachelet said that existing fires are now mostly under control, the Associated Press reports. “That doesn’t mean, however, that we are letting down our guard,” she added. With climate change expected to bring more hot, dry summer days to central and southern Chile, and land use shifts producing vast new swaths of combustible fuel each year, many feel the government should have taken steps to ensure fire brigades were better equipped. Of course, Chile isn’t the only country that’s been caught off-guard by a record fire season in recent years: parts of the western and southern United States, Canada and Australia have also grappled with once-unimaginable pyrotechnic devastation. Across the world, fire season is being transformed by humans. Clearly, it’s time we humans start to adapt. Correction: An earlier version of this article included an incorrect university affiliation for Dr. Fajardo. Gizmodo regrets the error.